Call it a lucky break for Poco! The band whose logo contains the universal sign of good fortune was not a shoe-in to succeed at their recent concert in the Empire State. Yet, their sold-out engagement at the B.B. 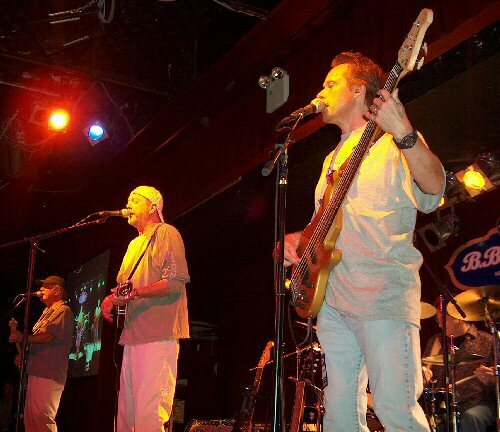 King Blues Club on August 27, 2005 surpassed the expectations of the club's booking agent and the evening's promoter. Poco is (l to r) Paul Cotton, Rusty Young, Jack Sundrud and George Lawrence! The promoter, Jeff Finowitz, was not a professional. In fact, this was his first attempt at organizing a concert. The promoter was just a "poconut"  the term associated with devotees of the country rock legends. But, he decided that Poco needed to be back in New York and with a firm resolve he approached the booking agent of the club not once, not twice, but three times with an organized presentation and portfolio on why the club should feature the band in their famed room. Finowitz's determination impressed so much that the band was awarded a high-profile Saturday night slot. The result was a sold-out performance by country rock's most resilient outfit. When Rusty, Paul, Jack and George trotted into town on this late summer day it had been over ten years since the band had played a venue in New York City proper. Their return to the Big Apple was a triumphant one for both the band and fans alike. Ecstatic "poconuts" were lining up early in anticipation of the concert passing the time by sharing stories of past shows and travels to see the de facto founders of the country rock movement. 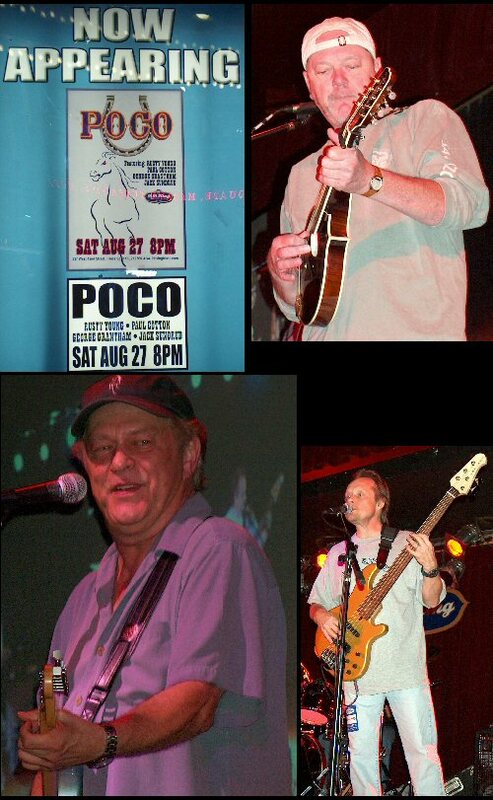 Poco was established in 1968 and many of the evening's attendees have been following them since the beginning. Poco headlines the B.B. King Blues Club in New York! The band promptly took the stage at eight p.m. appearing before an enthusiastic crowd shouting out song requests. Many fans waved and received nods of recognition from the band members who were about to treat them to a tight, all electric set of fifteen songs plus encores that included a good mix of classics and some of their more recent material. Rusty Young is well respected not only for his guitar playing but his magical work on the mandolin, lap and pedal steel. Rusty alternated between instruments utilizing many techniques and textures especially on the lap and pedal steel. On 'Indian Summer' Rusty was strumming the steel creating a Middle Eastern vibe at the beginning and end of the song. Throughout the show, Rusty was the main spokesperson for the band. At various times throughout the evening he thanked Jeff the "poconut" for his efforts to make the night happen, joked about The Eagles, and most notably stated that it was "great to be here" in reference to the band's return to New York. Mr. Young also handles lead vocals on many well known Poco classics as 'Crazy Love', 'Call It Love', and save 'Save A Corner of your Heart' which had a bluesy feel with solid rhythms and leads. Rusty also was the featured vocalist on 'Keep on Trying', which was originally sung by former Poco bassist Timothy B. Schmit who is now with The Eagles, the second Poco bass player who flew the coup to perform with their more commercially successful rivals. Paul Cotton is an impressive acoustic and electric guitar player. Paul provides complex chords on an acoustic and smoking leads on the electric. Mr. Cotton's voice is also a familiar favorite on many songs including 'Under the Gun', the spicy 'Cajun Moon' and 'Rose of Cimarron'. Paul performed the beautiful 'Bad Weather' on the electric, which is a rarity, with Rusty and Jack joining in on the harmonies. The evening's set closer was the radio friendly and eerily pertinent 'Heart of the Night' which is a love song for the now imperiled city of New Orleans. In addition to Paul's potent work in Poco he recently released his third solo album, the critically acclaimed When The Coast Is Clear on his own independent label. Jack Sundrud is the backbone of the band crafting solid bass lines and rhythms and he is also a featured vocalist in Poco. Jack sang lead on 'Shake It', a song with a lot of energy when performed live with Sundrud adding just the right tone and attitude. His strong vocals were also featured on the well-executed 'Never Get Enough'. 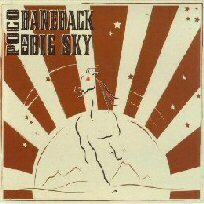 Both of these songs come from Poco's most recent studio release, Running Horse. Sundrud also has a new CD out called By My Own Hand demonstrating that he is a talented singer, songwriter, player and producer in his own right. In fact, he also produced band mate Cotton's latest offering. Poco's original drummer George Grantham suffered a stroke last year while performing with the band in Springfield, Massachusetts. His presence and vocal contributions to the group are missed but he has been suitably sat-in for by the effective George Lawrence who has been subbing for George #1 since his untimely medical emergency. Mr. Lawrence adds to the fuller sound that Poco achieves in an electric forum. 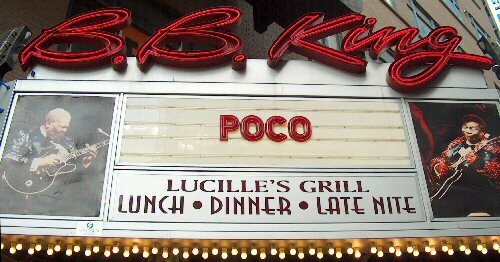 Poco's return to New York City at B.B. Kings was a smashing success. The band proved that they are still a vital force worthy of a Manhattan marquee. The group was in excellent form, their signature strong harmonies were well intact, and these first-rate players crafted an evening's worth of country rock music with a flair! The Saturday night concert was lively and the band members were clearly enjoying themselves as were the fans. On this night, nearly 40 years down the road from their founding, positive energy was in the air. After the show, the impressively long line to meet and greet the band stretched down around the stairs and back into the club. Many were left with the impression that the band would be invited back in the future and for the band and their "poconuts"  that's got to be a good feelin' to know! More scenes from the Poco show!